After more than half a century, crucial questions remain about the assassination of John F. Kennedy — a cold case of continuing importance to the fate of our democracy. The case has been clouded by the American media’s predilection to purvey misleading narratives on the actual doings of the US establishment, especially the “spy” agencies and their blandly referenced “covert operations” — some of which, evidence mounting over decades shows, relate to the president’s murder. Finding the truth involves what some might consider “getting into the weeds,” that is, reading through rather specialized material. The arcane pursuit of this elusive story in all its forensic complexity is not for everyone, especially in this era of instant gratification and short attention spans. Yet, the public loves a good mystery. Consider the millions of people who have been following a byzantine case — the murder of a young woman in Baltimore — first through the podcast Serial, and now on a new HBO series. And there is no bigger mystery than the JFK assassination. The challenge goes well beyond seeing through the usual cover stories designed to protect the sources and methods of shadowy government agencies. A powerful example can be found in the riddle of Antonio Veciana — the subject of this excerpt. Veciana, a Cuban exile who founded the murderous Alpha-66 anti-Castro terrorist group, was manipulated by both the CIA and the US military in the early 60s. So his story is already interesting. But there’s something else that’s important about Veciana: He may also link Lee Harvey Oswald — accused assassin of Kennedy — to the CIA. In the excerpt below, you will see Veciana’s bewildering activities through the eyes of John Newman, PhD — a former military intelligence officer and strategic intelligence cryptologic analyst, and former assistant to General William Odom when he headed the National Security Agency. Newman has written a number of important books exposing the nefarious activities of intelligence agents and their institutional enablers. For instance, in Countdown to Darkness: The Assassination of President Kennedy, Volume II (2017), he shows how Oswald’s activities in the Soviet Union and Mexico were linked to the CIA. But in his most recent book, Into the Storm, Newman connects all of the above to the Military-Industrial Complex, whose massive but rarely mentioned influence over American democracy President Dwight Eisenhower boldly warned against in his farewell address to the nation. The issue matters because, as we approach the 50-year anniversary of Eisenhower’s death, we seem to have learned nothing from his famous warning about the “Complex,” which is now more powerful than ever — and which was locked in combat with JFK at the time of his violent death. The principal task facing researchers today is to decide which accounts are true — or partly true — and which are not. If we are to rescue any pieces of this puzzle that were true, we must first strip away many pieces that were false. Phillips and his family left Cuba sometime in February 1960, narrowly escaping Castro’s clutches. Phillips would never set foot on the island again. Mid-1960 was impossible for an even more compelling reason: the real Dave Phillips was nowhere near Cuba! Even the most cursory examination of the declassified CIA records on Phillips reveals that he was not in Cuba in mid-1960. He was at CIA headquarters in Langley, Virginia, up to his eyeballs setting up the propaganda and psychological warfare operations for Eisenhower’s covert program to overthrow Castro. Why did Veciana lie, if he did indeed lie, about who approached him from the CIA, and when? In Part 2 below, another mystery emerges: Did Veciana approach the Army, or, as he claims, did the Army approach him? And why would either lie about it? Unraveling such questions is far from trivial. Rather, it can lay the basis for fundamental discoveries about issues at the heart of the struggle to preserve our democracy. Months passed while the CIA came to grips with the extent of the damage suffered by the MRP in Cuba. Well before that, however, the Agency had initiated the procedures for CIA to use Veciana as an MRP asset operationally. What was left of Veciana’s already minor operational relationship with the CIA fell completely apart during the spring and summer of 1962. 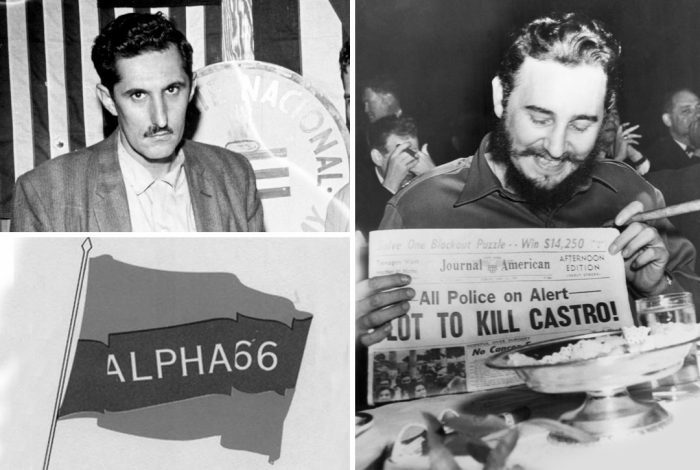 Veciana fled first to the US, and then settled in Puerto Rico in the spring of 1962, where he created a new anti-Castro organization, Alpha-66. However, Alpha-66 was inept as an action group. After several months, it boasted only one boat and a few weapons and, more importantly, it had no prospect of running raids against Cuba until the fall of 1962 — as the height of the Missile Crisis loomed. As 1961 gave way to 1962, the CIA quickly lost interest in using Veciana. The reasons for that went beyond the decline of the MRP’s usefulness in Cuba or the feebleness of Alpha-66’s sabotage capabilities. The Kennedy Administration was ramping up Operation Mongoose, a comprehensive government-wide program to overthrow the Castro regime. From the start, the sprawling multi-agency Mongoose program generated security concerns and those concerns escalated as the Missile Crisis approached. Save for one exception during the days just before the 13-day climax of the Missile Crisis, the Kennedy brothers were not interested in including Alpha-66 in their plans. The chief of the CIA Mongoose component, William Harvey, found Veciana to be a major nuisance. Harvey broadcasted government-wide alerts of any information he received about Veciana’s sabotage plans. However, as we will see in Chapter Fourteen [Ed: not included], dark operations were being stitched together in opposition to President Kennedy’s firm declaration that the US would not go to war in Cuba. Lansdale would soon find Veciana and his Alpha-66 quite interesting as a potential way to capitalize on the growing Soviet threat in Cuba. Eventually, Veciana let it be known that Alpha-66 planned to assassinate the Soviet Ambassador in Cuba and sink a Soviet ship in Havana’s harbor — actions that could potentially stir up a war and US invasion of Cuba. In May and June, Veciana was struggling to build his fledgling Alpha-66 sabotage group. On 23 July 1962, Jay Reeves of the CIA New York Contacts Office interviewed Veciana.3 The New York office granted Veciana’s request for an interview after Julio Lobo alerted the office to the request. Veciana explained that “Alpha,” for the letter A, meant it was the first group of its kind, and the number 66 indicated how many founding members belonged to the group. Veciana told Reeves that Alpha-66 intended to wage war on Castro’s Cuba and that its first objective was the assassination of Castro. 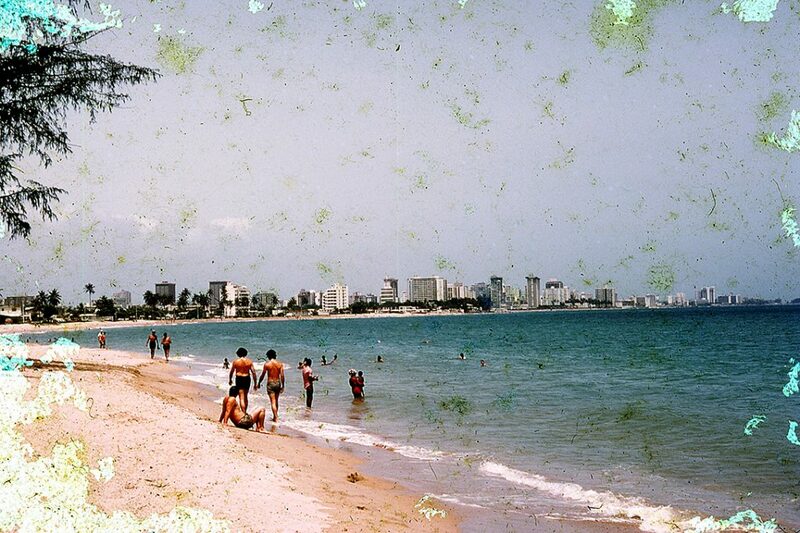 Veciana said that Alpha-66 had made several unsuccessful attempts to solicit CIA aid in Miami. He explained that he was still interested in CIA funding and requested a “conversation with someone in the Agency who is sufficiently high-placed to make a commitment.” However, Veciana made it clear that he would accept CIA help only if there were no strings attached. That would never happen. As the US-Soviet crisis deepened over the summer, events quickly began to unfold that would bring Alpha-66 under the direct control of US Army intelligence and indirectly under the influence of Lansdale’s Office of Special Operations in the Pentagon. Kill the Russian Ambassador to Cuba. Blow up the Esso Oil Refinery in the Regla section of Havana. Destroy the power plant in the Talla Piedra suburb of Havana. Sink a Russian ship in Havana Harbor. Kill a high-ranking Cuban official. Veciana predicted that these actions would begin in late July and would be finished by 22 September. As it turned out, none of them would begin until early September. And it would be US Army intelligence, not the CIA, that would have a front row seat as Alpha-66 raids took place against Cuban and Soviet shipping. Veciana’s intent to attack Cuban and Soviet shipping was well known to Lemnitzer and Lansdale. The question was — could Alpha-66 pull it off? 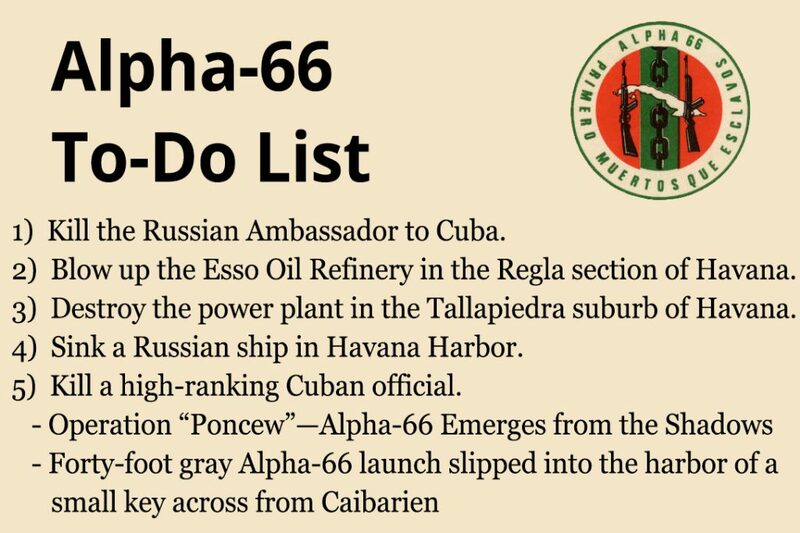 In early September 1962, Alpha-66 finally emerged from the shadows — months behind Schedule — to begin sabotage operations against Cuba. At 2:50 a.m. on 10 September, a forty-foot gray Alpha-66 launch slipped into the harbor of a small key across from Caibarien, a major Cuban port 210 miles southeast of Havana. The attacking vessel fired more than 60 rounds into the British freighter — the Newlane — and a Cuban ship. No casualties were reported. The Newlane was loading 31,000 sacks of sugar; the Cuban vessel was a dock boat used to store molasses. It was probably no coincidence that, at the time of its first raid, Alpha-66 established contact with both the CIA and the US Army through new informants. During the first week of September, Veciana designated a US citizen in New York, Robert A. Pratchett, to handle any CIA “coordination” with a designated Alpha-66 member. Superficially, Veciana was still interested in securing CIA “supplies and cash” to get his Alpha-66 harassment projects underway. On 7 September 1962, just days before the first Alpha-66 raid against Cuba, Pratchett began passing information from Alpha-66 to the CIA via Jay Reeves at the Agency’s New York Contacts Office.8 Pratchett indicated that Alpha-66 currently needed $30,000 to match what they had to fully operate. Harvey revealed that President Kennedy was “concerned” about the Alpha-66 “case,” and instructed the Panama and Puerto Rican stations to “report all information on Alpha-66 plans and activities.” At the station’s discretion, Harvey suggested that San Juan and Panama City should contact their local US Army representatives to monitor Alpha-66 plans. Clearly, Harvey suspected that Veciana was working with the Army. The two CIA stations were asked to add or confirm the information provided by HQS. Meanwhile, now that Alpha-66 was operational, Veciana sent an unambiguous signal to the US Army indicating that he wanted Alpha-66 to work for the US military instead of the CIA. Veciana made this precipitous decision at the time of the first Alpha-66 raid (mentioned above) against Cuba in September 1962 — two months before Veciana’s Interagency Source Register (ISR) transfer to the Army in mid-November 1962. The ISR was a mechanism designed to prevent operational control of a single source by more than one agency at a time. 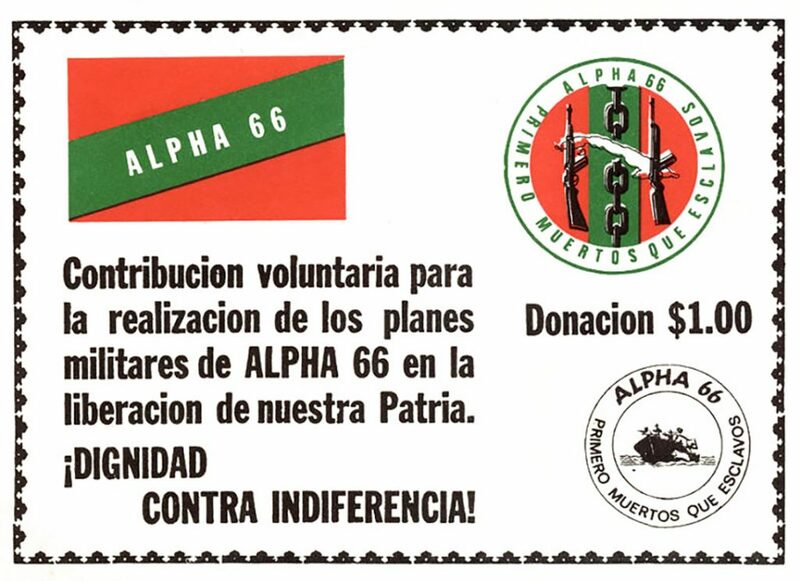 Alpha-66 intended to conduct raids against Cuba. Alpha-66 refused to work with the CIA, but desired to work with the US military. Alpha-66 wanted Army support in the “action phase,” i.e., funds, equipment, arms, etc. In return, Alpha-66 would provide intelligence information, would furnish captured equipment, and could land agents in Cuba. The group required $100,000 to complete the balance of its program, consisting of four more raids on Cuba. To assess Pfuntner’s claims, USAOSD asked him to furnish items of Soviet ordnance material and intelligence information on Cuba. The indelible record of this watershed meeting was written by US Army Colonel Jeff W. Boucher, Chief of the Army’s ACSI Collection Division, in a memorandum for General Lansdale. Boucher’s memorandum was not declassified until 7 October 1997 — nearly two decades after Veciana’s congressional depositions and interviews with Gaeton Fonzi. Veciana said nothing about his memorable proposal to congressional committees, Fonzi [Gaeton Fonzi, investigator for the House Select Committee on Assassinations], or in his 2017 autobiography, Trained to Kill. Meanwhile, on 8 October 1962, Alpha-66 conducted a raid against a Soviet ship at La Isabella, in Puerto Plata, Puerto Rico. It was a failure.13 The mine to be used against the Soviet ship was lost when the three frogmen — all from the Second National Front of Escambray (SNFE) — were drawn into the ship and “sucked up” against its side by the strong undercurrents.14 As a result, the raiding party attacked a beachside camp instead, wounding five Cubans and Soviets. This raid would have important consequences for the Pentagon’s use of Alpha-66. 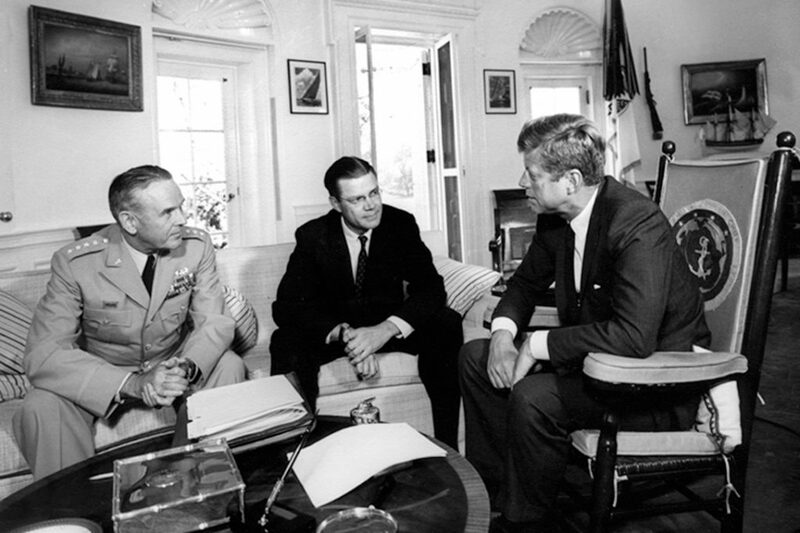 The day before Boucher’s memo landed on Lansdale’s desk, National Security Advisor McGeorge Bundy showed President Kennedy the U-2 photographs of the Soviet missile sites in Cuba. The Missile Crisis became public when President Kennedy announced the discovery of Soviet missile bases in Cuba during a televised address on 22 October. During the next two weeks, Army and Navy intelligence officers became interested in Veciana’s offer to provide access to the frogmen used in the raid for debriefing. The frogmen had potentially important information on Soviet underwater demolition team (UDT) countermeasures. Veciana had also offered to provide Soviet equipment from the La Isabella raid to the Army. Debrief the Alpha-66 frogmen by USAOSD and ONI representatives. USAOSD explore possibility of purchasing Soviet equipment from Alpha-66. Briefing of General Lansdale on the Alpha-66 proposal to provide intelligence information and material in return for support, pointing out that financing, if any, is the responsibility of the CIA. The reason for continued CIA financial responsibility was possibly because — from the Army perspective — Veciana had still not been transferred by that time to Army control under the ISR protocol. The Boucher memo is noteworthy for two reasons. First, Veciana was earnestly working Alpha-66 into a relationship with the Army. Years later, he would first give Gaeton Fonzi, and then the researchers at the 2014 AARC (Assassination Archives and Research Center) conference in Maryland, the distinct impression that it was the Army that had approached him first, not the reverse. I will return to this point below. The significance of the Boucher memorandum is also underscored by who it was written to — Brigadier General Lansdale. He was head of the Office of Special Operations, a DOD component serving directly under Secretary McNamara, along with the Joint Chiefs of Staff (JCS). To repeat, the enthusiastic 17 October ACSI-approved measures passed to Lansdale concerning support for Alpha-66 (mentioned above) coincided with the start of the 13-day Cuban Missile Crisis. The propinquity of the momentous Missile Crisis to the military’s interest in Veciana’s promises — at the “highest levels” in the Pentagon — is striking. But just as arresting is the fact that the ACSI proposals for using Veciana were only superficially overtaken by events. As we will see in Chapter Fourteen [Ed: Chapter Fourteen is not included in this excerpt], by this point, Lansdale had already sided with General Lemnitzer in his confrontation with President Kennedy over going to war in Cuba. Using his characteristic skill of subterranean maneuvering, Lansdale acted to keep Veciana’s plans to attack Soviet shipping in play. Lansdale worked to screen from view his own oversight of Alpha-66 and to exclude any CIA control of the group. As the world waited to see what the United States would do about the Soviet missile bases in Cuba, the Joint Chiefs put intense pressure on the president to bomb the bases. Plans were again readied for a US military invasion of Cuba. As the Missile Crisis moved to the brink of war, Kennedy and Khrushchev inched their way toward a possible solution to the impending nuclear crisis. By 26 October, that solution stipulated that the USSR would withdraw its missiles from Cuba in exchange for a public assurance that the US would not invade Cuba and a private promise that the US would withdraw its Jupiter missiles from Turkey at some point in the future. On 27 October, RFK offered the above terms to the Soviets. On 28 October, Khrushchev agreed to those terms. On 29 October, it appeared that, for the first time in the crisis, a nuclear conflict might be averted. Then, on 30 October, in a hastily convened meeting of the EXCOMM, President Kennedy ordered a complete stop to all sabotage activities. The fact that the president so cavalierly brushed aside the CIA’s protest — that they had no control over Veciana — is noteworthy. Kennedy’s forceful demeanor made it clear that he expected the Agency to get control of Alpha-66 quickly. Whether or not the president’s unyielding directive was realistic, his message was not lost on those attending the meeting nor those who heard about the order afterward — like Lansdale. Kennedy’s third directive ordered the suspension of all prior approvals for sabotage, infiltrations, guerrilla activities, and caching of arms. The fourth directive sharply proscribed any contacts with the press. After the meeting, DCI McCone, National Security Advisor Bundy and Attorney General Kennedy discussed the previously approved plans for sabotaging Cuban ships and shipping operations in general (discussed above in Lansdale’s 26 October memo). All agreed that these operations should be suspended for the next several days. There was still concern that although a solution seemed to be at hand, it would take several more days to be certain whether it would hold. The events that took place concerning Alpha-66 during the subsequent days were recorded in an Army memorandum from ACSI’s Collection Division20 and messages between the ACSI USAOSD office in the Pentagon and its field element in Puerto Rico.21 These communications between Washington and San Juan took place during the tenuous hours during which the implementation of the Kennedy-Khrushchev solution was being closely monitored. Lansdale’s subterranean activities with Alpha-66 were also mentioned in Colonel Boucher’s 1 November memorandum. But neither Bobby Kennedy nor DCI McCone knew about Lansdale’s involvement in the Pentagon’s continuing cooperation with Alpha-66 after the president’s order that the group’s activities be grounded. Despite Kennedy’s 30 October order, Lansdale’s activities with respect to Veciana and Alpha-66 continued — during the long days of 1 and 2 November 1962 — as the fate of the still vulnerable Kennedy-Khrushchev attempt to pull back from the brink of war hung in the balance. On 1 November 1962, an expanded Pentagon meeting of ACSI and DOD officers took place in the Pentagon to consider what to do about Alpha-66 operations. In that meeting, Lansdale once again lived up to his reputation as a “lone wolf and operator.” I spent an entire chapter on Lansdale’s proclivity toward this kind of behavior in my book, JFK and Vietnam (see Second Edition, 2017, Chapter Two). The Army officers at ACS I — and their subordinate Operational Survey Detachment (OSD) in San Juan — were not oblivious to the extreme sensitivity of their association with Alpha-66 operations during the critical moment of Soviet compliance with the agreement to dismantle their missile bases in Cuba. Colonel Boucher realized that mounting the operation being discussed in San Juan on 1 November had significant implications for presidential policy. That operation involved Army and Navy personnel going outside of US territory to visit an Alpha-66 training site and meet with frogmen involved in the attack on the Soviet Ship at La Isabella. 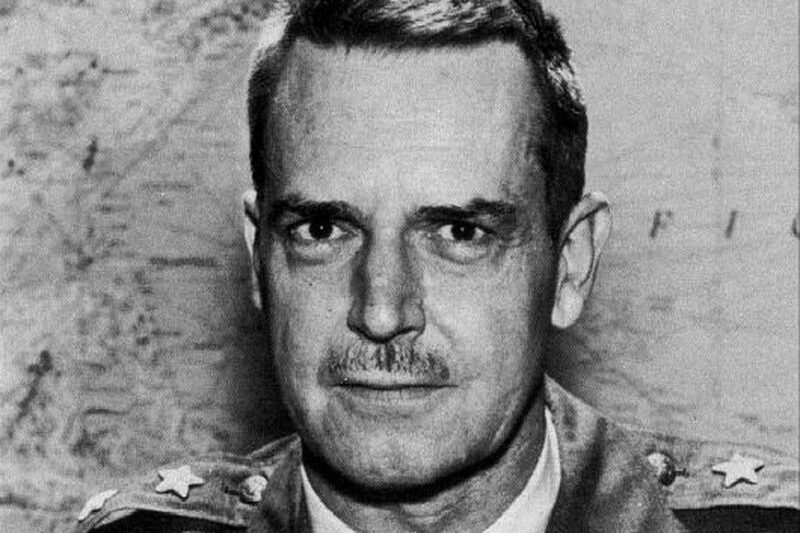 According to Boucher’s 1 November memorandum, the operation was “stymied by the lack of clear policy” on actions against Cuba and the Soviet Union. Evidently, Lansdale thought that he was in a better position. The memo does show that Lansdale and Veciana were on the same page with respect to keeping the CIA in the dark about the Pentagon’s plans for the use of Alpha-66 and their exploitation of the group’s operations. Strangely, Boucher’s draft memo gives no indication that Lansdale passed along the president’s order to suspend Alpha-66 operations. Lansdale’s 30 October memo (discussed above) — only two days earlier — makes it crystal clear that he understood the president’s orders to stop Alpha-66 activities. On the telephone that same day, McCone had told Lansdale that the president had specifically ordered Alpha-66 sabotage operations against Cuba be stopped! I find it difficult to imagine that Colonel Boucher’s memo about the 1 November meeting with the generals would not have included the presidential order if Lansdale had — as he was required to do as the Mongoose operations chief — relayed the order to the officers present. Boucher’s silence on the matter is disturbing. I now return to the unforgettable moment-by-moment action on the Alpha-66 problem that took place on 1 and 2 November 1962. It was still in the early hours of the dismantling of the Soviet missile bases. The Pentagon–Alpha-66 activity that took place during this fragile moment is reported for the first time in this volume. Except for contact with “Patrick Harris” — a pseudonym for Army Captain Milford P. Hubbard — this story is a secret part of Veciana’s life that has all but disappeared. The action took place simultaneously along parallel lines. It unfolded in the Pentagon and among the US Army’s assets in Puerto Rico. It also unfolded in the hourly — and sometimes moment-by-moment — communications between the Pentagon and Puerto Rico. On the same day in the Pentagon, Colonel Jeff W. Boucher, chief of ACSI’s Collection Division, wrote a draft memo about the ACSI meeting with several colonels and generals in the Pentagon — including Brigadier General Lansdale — about how to handle the Alpha-66 problem.23 For reasons that will soon become apparent, I will first take the reader — with minimal commentary by me — through the hectic, moment-by-moment action between the Pentagon and Puerto Rico. The Army ACSI and other military components in the Pentagon were keen to obtain and exploit as much intelligence as possible from Veciana’s raids against Cuban and Soviet shipping. Moreover, they wanted to do that as fast as possible. That had to happen before the final negotiations over the Cuban Missile Crisis could preclude the successful acquisition of that intelligence. That concern infused a high degree of urgency into communications between the Pentagon and Puerto Rico and into Army-Veciana activities on the ground in Puerto Rico. Counterposed to the frenzied activities that took place on 1 and 2 November 1962, we have the nonchalant scenario that Veciana told Gaeton Fonzi about those activities, two decades later in the mid-1990s. Only by exposure to the sequence of events captured in the contemporary Army memoranda can observers today appreciate the depth of the difference between the events of 1962 and how Veciana described them in 1992. The final sequence of events in this episode of Veciana’s life began at approximately 5:17 p.m. EST on 31 October 1962. … Events were moving very fast, rendering many plans obsolete before they could be implemented. At 2:35 p.m., Ralph DeGagne of the 471st INTC Detachment at Fort Brooke, Puerto Rico called Veciana and made an appointment to meet him, along with Harris (Hubbard) and “Roberts” (pseudonym for King) ten minutes later at the Red Rooster — another favorite Army hangout in San Juan. Veciana joined the three Army officers at the restaurant at 3:15 p.m. After introductions and “small talk,” Veciana gave Harris and Roberts two rifles and ammunition allegedly taken from the Russians at La Isabella. That unforgettable moment — of the payment of that promised tribute of captured Soviet equipment in front of three Army officers — vanished years later when it became inconvenient for the development of Veciana’s CIA narrative. Hubbard, King and Veciana then left the restaurant to talk privately on a side street. Veciana provided the names of two of the La Isabella frogmen: Julio Cruz and FNU Castillo, both members of the SNFE. Veciana said they were not on US territory; rather, their base was one and a half days out of Miami by boat. The location of the base on a remote island in the Bahamas would pose a problem for a timely debrief of the frogmen. Harris made an appointment to meet Veciana at 7:30 p.m. Meanwhile, at 5:40 p.m., King had received a call from Colonel J. E. Boyt, the USAOSD Commander at the Pentagon. Boyt indicated that he had recommended a “go” to the “people upstairs” for the proposed plan to debrief the frogmen. Boyt told King that no decision had been reached yet and that he would call back the next day. Boyt added that consideration was being given to some kind of “financial remuneration” for Alpha-66. Veciana claims that he upheld his end of the deal, while Harris did not. Veciana’s account to Fonzi masks the truth about Veciana’s campaign of enticements — begun in the first week of September — to secure a relationship working for the Army instead of the CIA. The Army did not approach Veciana first; rather, it was Veciana who approached the Army first. To repeat, Veciana’s first message to the Army, delivered through Pfuntner, was that he wanted his Alpha-66 group “to work with the US military” instead of the CIA.25 A month later, after the Alpha-66 attempt to sink a Soviet ship at La Isabella, Veciana offered — through Pfuntner — to make Soviet military equipment and the frogmen used in the raid available to Army intelligence. Twelve days later, on 20 October in San Juan, Veciana was interviewed by the Army about the raid. The Army interviewer was not Captain Hubbard (Harris); rather, it was Colonel King (Roberts). The Army officers in Puerto Rico felt that the Soviet rifles could have been obtained elsewhere and that there was “no conclusive evidence that the operation at La Isabella actually took place!”26 Nevertheless, Veciana’s enticing offer to work with the Army succeeded. ACSI decided to move forward to see if Veciana could deliver the access to the frogmen that he had promised. Contrary to Veciana’s 2014 story to the AARC (see below), Captain Hubbard (Harris) was not his first and only contact with the Army. Harris did not enter the story until 1 November 1962 — two months after Veciana’s communications with the Army began through Pfuntner. Therefore, Veciana did not need several conversations with Harris (as he had told Fonzi) in November to understand what he already knew — that he had been dealing with the Army since the first week in September. At the 2014 AARC conference in Bethesda, Maryland, Malcolm Blunt asked Veciana about his relationship with the US Army. Veciana downplayed that relationship. He suggested that it was no more than meeting with a man named Harris in the Caribbean. The bottom line: Veciana’s account in 2014, like his earlier account to Gaeton Fonzi, downplayed his own — crucial — role in establishing his relationship with the Army. The idea of debriefing the frogmen was not something that Hubbard (Harris) came up with during the 1 November dinner at Under-the-Trees. That idea had been in train ever since Veciana first used it on 12 October as a lure (relayed through Pfuntner) to help ingratiate his way into the hands of the US Army. And the 13-day Missile Crisis provided the perfect motivation for the Army to take the bait quickly. I will now return to the remaining minute-by-minute communications between the Army ACSI — in the Pentagon — and their unit in Puerto Rico. The record of that anxious back-and-forth interplay is fascinating. There was not a moment to lose. The situation unfolding on 1 November 1962 raised the possibility of excluding any American naval expedition outside of US territorial waters to make contact with anti-Castro exile sabotage operations. As discussed above, at 5:30 p.m., the USAOSD commander had recommended a “go” to the “people upstairs,” anticipating an answer the following day. But he did not have to wait. The authorization to proceed came just 90 minutes later at 7:00 p.m. However, President Kennedy had not yet decided that the evidence of the dismantling of Soviet missiles was enough to declare that the crisis was over. 15:40 hrs: [HQS] called — NO GO!!!! COMMAND DECISION — Neither the Navy Commander, nor us [i.e., the Army], can go outside US territorial waters for this type mission. This is exactly what ACSI HQS had feared might happen and why there had been such a rush to debrief the frogmen before the president slammed the door shut. Authorized to meet frogmen and Veciana in Miami. None of the actual high drama that took place in the Pentagon and Puerto Rico during the most intense moments of the Cuban Missile Crisis is reflected in any of Veciana’s later recapitulations of his relationship with the Army. According to the Army’s records, showing Hubbard (Harris) the Alpha-66 exile training program on the island was Veciana’s idea. He was the one who “warmed up” to Harris and said that he wanted Harris to see the training of Cuban exiles “on the island where they were going to” debrief the frogmen. How important is this distinction between the contemporary ACSI account of their involvement with Veciana and Veciana’s later account to Fonzi? It is very important. The credibility of Veciana’s account of his nearly nonexistent relationship with the Army is already hanging by a thread and the contemporary Army records undercut that account. In a nutshell, Veciana buried a dramatic high-level ACSI-DOD rush plan — taking place as the US waited to see if Khrushchev would dismantle the missiles — to get crucial intelligence on UDT countermeasures out of the La Isabella frogmen. Instead, Veciana turned that dramatic event into a nonchalant query — unconnected to the global crisis taking place at that time — by a single low-level Army asset in San Juan, Puerto Rico. How could Veciana not remember giving instructions to Jordan Pfuntner to approach the Army with a landmark entreaty to work for them — instead of the CIA — in return for promising to furnish the Army-captured Soviet equipment and to land their agents in Cuba? How could Veciana not remember that his conversations with Hubbard (Harris) occurred at the most critical moments of the Missile Crisis? How could Veciana not remember the many times that the Army-Navy trip to debrief the frogmen was off and then on again? How could Veciana have forgotten his meeting with three US Army officers — men known to him as Harris (Captain Hubbard), Roberts (Colonel King), and Ralph DeGagne at the Red Rooster on 1 November — the meeting at which Veciana gave Harris and Roberts two rifles and ammunition allegedly taken from the Russians at La Isabella? And how credible are those forgotten Army memories compared to the hundreds of details Veciana recalls about his alleged work with the CIA? The years of Veciana’s relationship with the Army (1962–1965) are the most secret period in his life. The reason for that is because Veciana has chosen to keep it that way. He largely avoids the events that took place during his work for the Pentagon. His HSCA deposition avoids them; he only discussed them lightly with Gaeton Fonzi; he downplayed them at the 2014 Bethesda, Maryland, symposium; and he never mentioned the Army at all in his 2017 autobiography, Trained to Kill. What was Veciana’s likely motive in changing the story in this manner? At this point, I can only proffer a guess. By the time Veciana later recounted his story to Fonzi — during the years 1976–1980 and beyond — Veciana was disingenuously establishing his alleged long-term bona fides with an organization he had disliked and distrusted — the CIA. 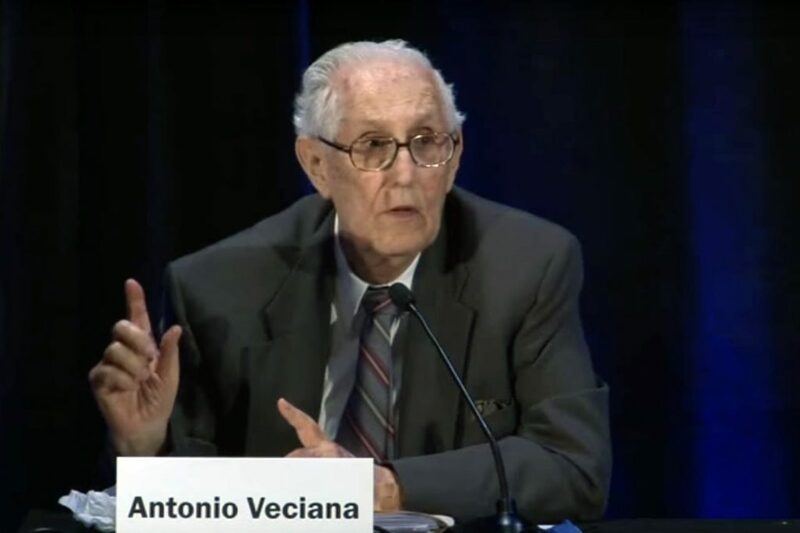 Veciana needed to bury the truth about what happened in Puerto Rico on 1 and 2 November 1962 in order to underpin his fictional long-term work for the CIA — in particular, his association with the Army during the years 1962–1965. That Army relationship was harmful to his claim to have been working for Dave Phillips in the fall of 1963. It is possible that Veciana concocted the story of his work for the CIA in 1963 in an Atlanta prison during the period January 1974 to February 1976. 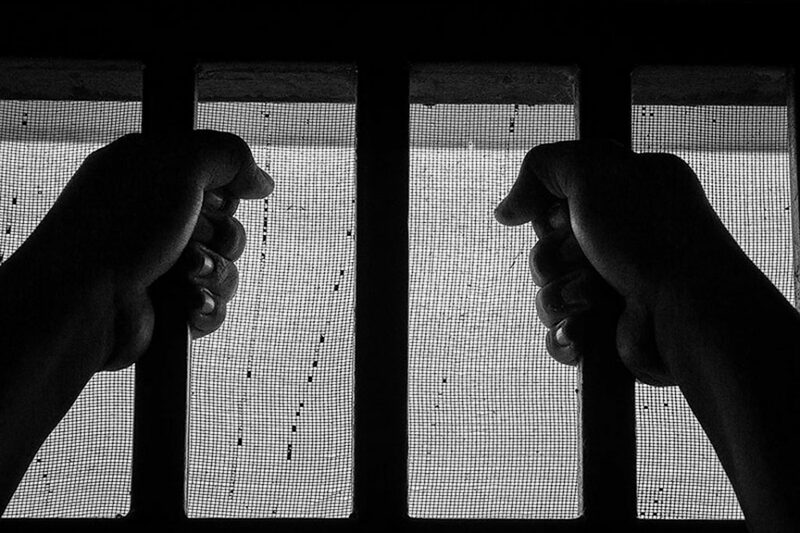 He was serving time due to a — possibly trumped up — conviction for cocaine smuggling. My suspicion — at this point — is that Veciana’s 26 months in prison might be the key to the entire story of his association with Phillips from 1959 to 1973. Decisions made during his incarceration might explain everything. And, then again, they might not. I have not yet come to any firm conclusion and am in no hurry to do so. But, at this point, it is only fair to the reader that I report what I discovered in the 14 November 2017 release of JFK documents about Veciana’s big Zabala secret — a true story that he has never shared publicly. Let me end this chapter with an escapade that Veciana pulled off after he was released from prison in February 1974. It was an exploit rife with implications for Veciana’s claim that he met Oswald with Phillips in Dallas in the fall of 1963. Felix Zabala Mas was Veciana’s closest friend. Other than his wife and children, there was no one closer to Veciana than Zabala. Veciana was the godfather of Zabala’s son. Like Veciana, Zabala had been a banker in Havana and a member of the anti-Castro resistance. He fled to the US and settled in San Juan, Puerto Rico where he became a boxing promoter and a charter member of Veciana’s Alpha-66. In Zabala’s memory of that approach, the proximity of Veciana’s confidential sharing of his alleged 1963 Bishop-Oswald meeting in Dallas to Veciana’s need to publicly establish himself as a former CIA operative speaks volumes today. It may be a crucial beacon shining light on that singular moment that has captivated researchers of the Kennedy assassination ever since Fonzi reported his 1976 interview with Veciana. 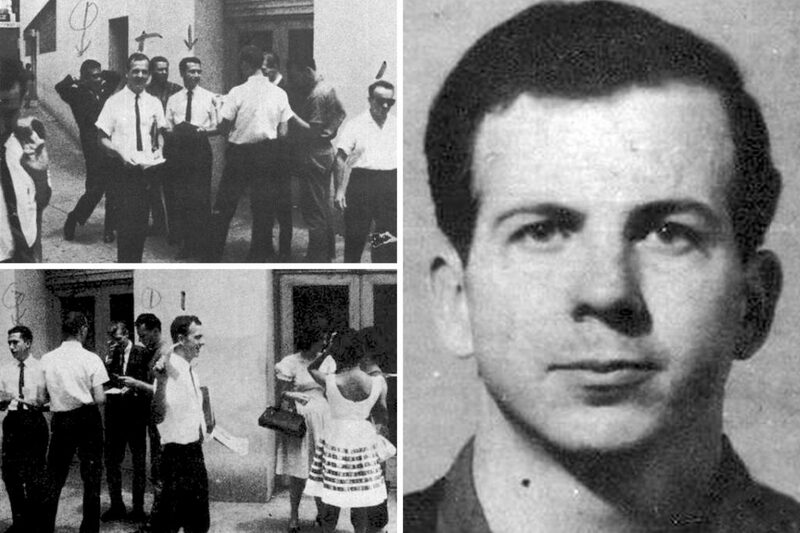 Lee Harvey Oswald and others handing out “Fair Play for Cuba” leaflets in New Orleans, August 16, 1963 (Top left and bottom left). Lee Harvey Oswald in Minsk (right). Photo credit: Warren Commission Report / Wikimedia, Warren Commission Report / Wikimedia, and Warren Commission Report / Wikimedia. But there is more to the story. Upon confiding the Bishop-Oswald story to Zabala, Veciana then asked Zabala for a very unusual favor. He asked Zabala to use his sister — who was married to Julio Cesar Mas Martin, a Cuban doctor in Havana — to place into Castro’s hands a letter describing Veciana’s involvement in a 1971 plot to assassinate Castro in Chile. In all of his interviews with Gaeton Fonzi and in his testimony for the Church Committee and House Select Committee on Assassinations, Veciana said nothing about Felix Zabala. Veciana’s best friend — who had been with him from the creation of Alpha-66 through the abortive assassination plot in Chile — was nowhere to be found in Veciana’s 2017 autobiography, Trained to Kill. Why did Veciana leave him out? Would including it undercut the credibility of his alleged meeting with Phillips and Oswald in 1963? The formula used at the 26 February 1962 Special Group Augmented meeting on behalf of the Kennedys was not a direct affront to Lemnitzer’s plans for war in Cuba. But the reprimand of Lansdale put the ball firmly in Lemnitzer’s court. He understood what he had to do. And so, Lemnitzer put his Operation Northwoods on the table two weeks later, on 13 March 1962. In Chapter Fourteen [Ed: not included in this excerpt], I discussed the morally depraved details of Lemnitzer’s plan — sinking an American ship, attacking Miami, Washington and other American cities, and blaming it all on Cuba. However, as this volume went to press, I discovered a memorandum indicating that a blunt rebuke of Lemnitzer by JFK took place. I will discuss that memo further in Volume IV. Here, as a career US Army officer, I am compelled to speak my mind. I speak for myself and will leave other officers of the American Armed Forces to their own counsel in this matter. As the moment of maximum danger in the Cuban Missile Crisis approached, the president finally got around to firing Lemnitzer. On 1 October 1962, Kennedy installed General Maxwell Taylor as the new Chairman of the Joint Chiefs of Staff. The choice of Taylor, as events turned out, was a very bad mistake. Taylor would end up working secretly with other senior officers to subvert President Kennedy’s order to begin the withdrawal of US military advisors from Vietnam. The ship of the brothers Kennedy was sailing headlong into the winds of war. Though they might still stop it in Cuba, war was coming nonetheless. The miraculous conclusion of the Cuban Missile Crisis would be short-lived. It was only an intermission — much like the passing eye of a huge hurricane. Roberts, (first name unknown) — Pseudonym for Grover C. King, Army Lt. Col.
CIA Cuban Revolutionary Handbook, p. 390. 7/26/62, Jay B. L. Reeves to Chief, CIA Contact Division, Subject: Antonio Veciana and Alpha 66; RIF 1993.07.14.17:06:24:150340. See also 5/00/77, CIA Review of Veciana 201 File, NB: the New York Chief was Harry Real, but Reeves did the interview; RIF 104-10102-10176. 7/11/62, DIR 22545 (TWF PA-PROP, Tharpe) to JMWAVE, RE use of Veciana for MRP sabotage ops; RIF 104-10181-10203. Allison, Graham and Philip Zelikow, Essence of Decision: Explaining the Cuban Missile Crisis (New York: Addison Wesley Longman, 1999), p. 80. John T. Correll, “Airpower and the Cuban Missile Crisis,” Air Force Magazine, 88 (8). 8/11/62, FBI SJ to HQS, RE Alpha 66; RIF 104-10102-10073 and 194-10002-10039. 9/7/62, CIA Memo from Chief, New York Office to Chief, Contact Division; RIF 104-10069-10094. 10/17/62, ACSI-CO 6.201, Col. Boucher to BGen. Lansdale; 198-10004-10015. 11/16/62, ISR Trace Request, confirming ISR transfer of Veciana from CIA to Army on 15 November 1962; RIF 104-10181-10195. Later, on 30 January 1963, Veciana was assigned the Army ACSI crypt DUP 748. 10/20, 62, Atlantic Command, US Army Caribbean, Message to ACSI, USAOSD, Subject: Alpha-66; RIF 194-10003-10392; see also Blunt DOD Documents on Veciana, p. 1. 4/19/66 MAJ John F. McGowan MFR Re Veciana; Blunt DOD Documents on Veciana. 10/22/62, Veciana interviewed by US Army LT COL Grover C. King; RIF 194-10003-10394. 11/1/62, Colonel Boucher, ACSI Collection Division, “Draft of Contact with Veciana”; … “so they [Hubbard and King] held discussions with ‘higher levels, i.e., General Lansdale.’” DOD Files on Veciana, p. 8 [Blunt, DOD Veciana Files]. Many years ago, British researcher Malcolm Blunt came across 9 pages (page 4 was missing) of important “Department of Defense (DOD) Files”—also referred to as DOD Notes”—on “Antonio Veciana Blanch, #AA90 4916.” Blunt shared them with me. At the time, this material was located in NARA’s “Reference Copy, JFK Collection, HSCA (RG 233).” So far, my attempts to locate these documents again have been unsuccessful. Researchers can find these documents at my website, jfkjmn.com. 10/26/62, CIA memo, DCI McCone to DDCI Carter, Subject: Operation Mongoose, “Main Points to Consider”; RIF 202-10001-10199. 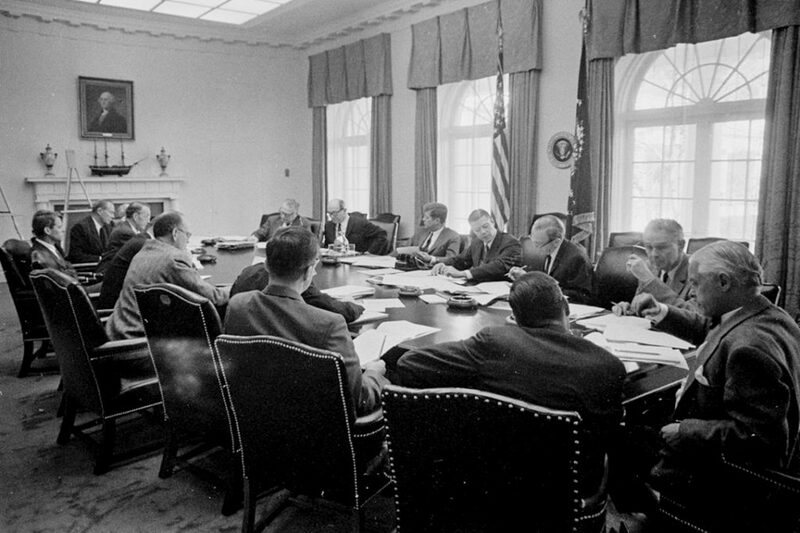 10/30/62, McCone Memorandum to General Marshall S. Carter; RIF 104-10396-10020. 11/1/62, Colonel Boucher Draft of Contact with Veciana; Blunt DOD Documents on Veciana. 10/22/62 and 11/1/62, Army messages from Puerto Rico to the Commanding Officer, US Army Operational Survey Detachment (USAOSD); see RIF 194-10003-10394 and 194-10003-10393. 10/22/62 and 11/1/62, Army messages from Puerto Rico to the Commanding Officer, US Army Operational Survey Detachment (USAOSD); my examination of an accompanying Army memorandum from Puerto Rico suggests that Lieutenant Colonel Grover C. King was the author of this memo; see RIFs 194-10003-10393 and 194-10003-10394. 11/1/62, Colonel Boucher Draft of Contact with Veciana; Malcolm Blunt DOD Documents on Veciana. Gaeton Fonzi, The Last Investigation (New York: Skyhorse, 2013 Edition) p. 136. Fonzi further elaborated: “From a discussion with an Army Intelligence asset I had been sent to interview in New Orleans, I also deduced that the CIA had told the Committee that Veciana and Alpha 66 were monitored not by the Agency but by Army Intelligence. I thought this was a misdirection. I pointed out that Veciana was aware of his contacts with Army Intelligence, that they covered only a limited period of his anti-Castro activities, and that they were separate and distinct from his relationship with Maurice Bishop. Nevertheless, after the CIA denied an interest in Veciana, the Committee staff pursued the Army Intelligence angle up until the end.” See pp. 147-148. 10/27/62, CGANTCOMC/USAR CARIB, Fort Brooke, PR to ACSI, DA, WASH DC; Malcolm Blunt DOD Documents on Veciana. 4/9/77, FBI San Juan to Director FBI, RIF 124-90152-10013. See the 11/14/2017 release of this document and compare it to the former, heavily redacted, version. 4/8/77, FBI, San Juan, Antonio Veciana, Interview with Zabala; RIF 124-10325-10301, p. 43. 12/31/64, FBI San Juan Teletype to DIR, SUBJ: SNFE, Alpha-66; 124-10280-10046. In this case, Veciana, on fundraising trip, was staying at Zabala’ home since 10/23/64. 7/26/73, DEA immediate for John T. Cusack, DEA International Operations Division; RIF 104-10181-10185. NB: There is a mistake on the RIF sheet: the that 7/26/63 is a garble for 7/26/73. 3/00/79, HSCA document: Anti-Castro Activities and Organizations and LHO in New Orleans; “Antonio Veciana Blanch,” Fonzi interview for Schweiker subcommittee of the Church Committee, p. 99; RIF 180-10147-10240. Veciana, Trained to Kill, p. 187. 4/9/77, FBI, San Juan to FBI Director, Felix Zabala Mas—IS-Cuba; RIF 124-90152-10013. See Newman, JFK and Vietnam, 2017 Edition, p. xxiv. Related front page panorama photo credit: Adapted by WhoWhatWhy from flags (Corey Seeman / Flickr – CC BY-NC-SA 2.0) and storm (US Air Force).